The 8th Annual BKLYNDESIGNS Offered Up Some Tasty Locavore Design Treats. 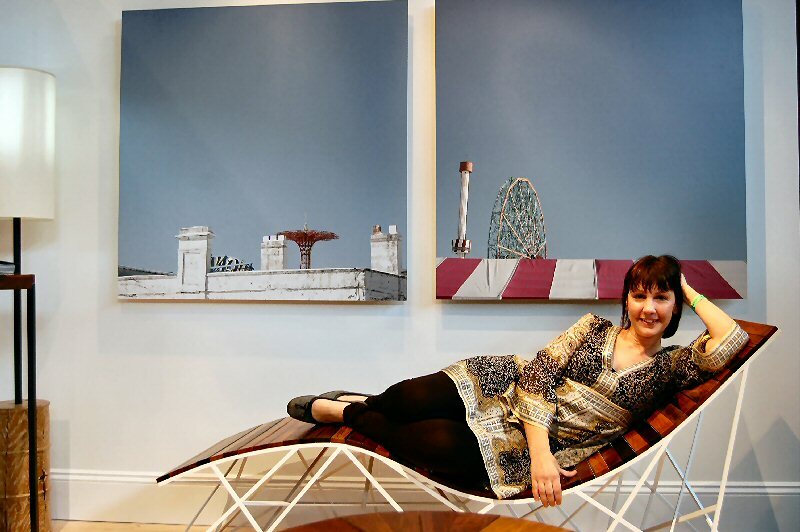 NYC Interior Designer, Kelly McGinniss, relaxes on UHURU's chair made of reclaimed wood salvaged from the Coney Island Boardwalk. It's been said in Big Apple real estate lingo that Brooklyn is the new Manhattan. But, it's BKLYN, thank you very much. And, maybe BKLYN isn't so much the new Manhattan as it's a mini Milan--as in Milan Furniture Fair. 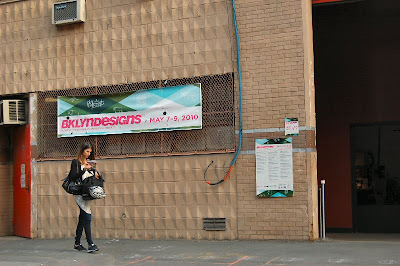 This thought took shape last weekend while observing some pretty GRVY international design denizens milling around catching the laid back vibe at BKLYNDESIGNS which features only products made in BKLYN. 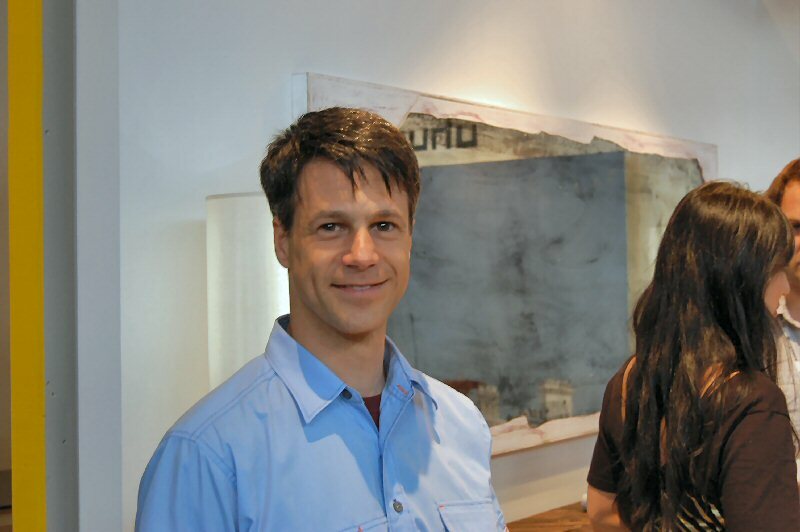 NYC Interior Designer, Kelly McGinniss, and I stumbled onto some cool products and people that showed the depth of creative sustainable design energy lurking out there in BKLYN. The creativity seems to emanate from all parts of Brooklyn-everywhere from DUMBO, where BKLYN Designs took place at St. Ann's Warehouse, to Greenpoint to Red Hook, where the folks at UHURU have been conjuring up some amazing objects for years running. 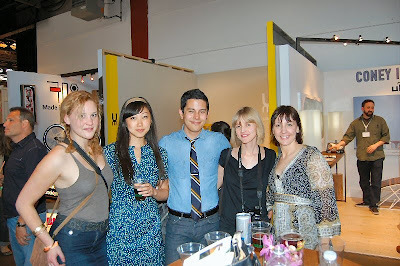 The editors of Inhabitat were on hand to hand out awards to some of the designers at BKLYNDESIGNS. Inhabitat is one of my daily reads along with TreeHugger and my other fav e-news blasts. I got a chuckle from the Inhabitats upon asking if they were "Inhabitats" or "Inhabitots", the latter a reference to Inhabitots which is the "kid" version of Inhabitats. 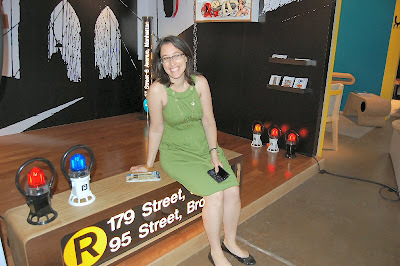 I love the positive energy of Jill Fehrenbacher and the Inhabitat posse. They are a shining example of the dynamic green energy in NYC. They celebrate the creative design happening in the Big Green Apple while bringing news of the best international design back home. Indeed, as Inhabitat says: "Design Will Save The World!" Inhabitat Editors (Left to Right)Rebecca Paul, Yuka Chino, Mike Chino, Jill Fehrenbacher with Kelly McGinniss. I have been following UHURU since they founded their company over 5 years ago. They make sublimely beautiful objects meticulously designed with scrap wood. 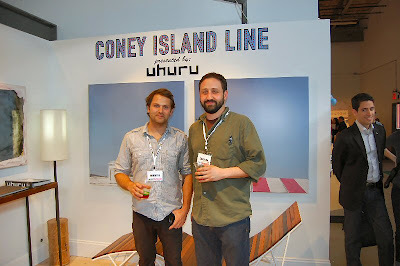 Their new Coney Island Line crafted from reclaimed wood salvaged from the legendary Coney Island Boardwalk is incredible. Madbutter's interactive LED video installations might not make sense for the average home or apartment. However, they definitely would be a dynamic visual statement at a club or public venue. 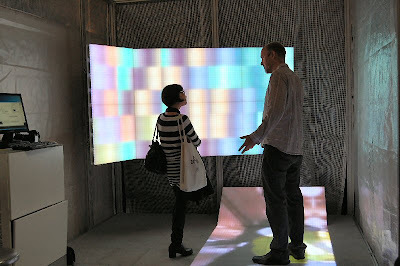 The holodec-like display at BKLYNDESIGNS was interactive. By either touching or walking on the screens, the color and light changed. Andre Joyau with his assistant Angie Higdon. 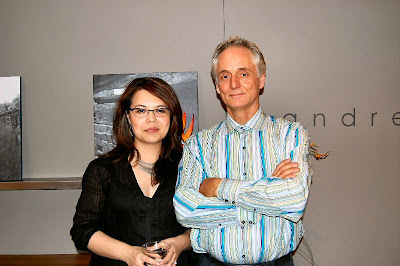 These two, Andre Joyau and his assistant, Angie Higdon, were definitely an engaging, feisty pair. The furniture and lighting that Joyau makes is elegant. I felt like sitting down at his booth and having a meal at the long table made from reclaimed wood. When I asked Angie how she would describe the work, she enthused: "Modernism with a soul!" While conversing at the UHURU booth, Corey Distasio related that he has years of experience in Industrial Design and Design Management. He's now, also, a licensed acupuncturist and expert on Chinese herbs and medicine. He posed an interesting question: "Instead of talking about renovating a home, what if your home renovated you?" I liked Corey's concept that home design should not only feature sustainably made products, comfort and convenience, but also work to create a healing environment. Russian poet and author of Dr. Zhivago, Boris Pasternak, wrote a line in a poem just before he died: "The Whole Wide World is a Cathedral." Indeed, our homes, our places of work, worship and the buildings we create should be places of transendence and healing that reflect the beautiful mystery that is the world. Green Design might not on its own save the world, but it surely has a place in the pantheon of green possibilities that can create a sustainable future while soothing our souls.